... with an SAK! 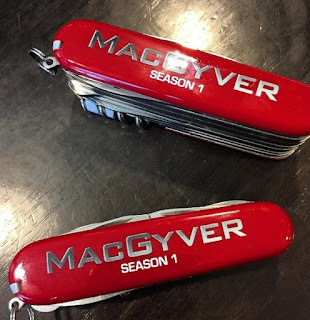 Back in November, Executive Producer Peter Lenkov had posted a picture of an SAK with the official logo for Season 1. Every now and then, other pictures showed up on social media by script writers and cast members - but it was still unclear if it was an exclusive gift for the crew or if eventually everyone would be able to get one of these as an official merchandize tool. It looks like several more of these SAKs were handed out before Christmas Break because many pictures have popped up over the last few days (e.g. 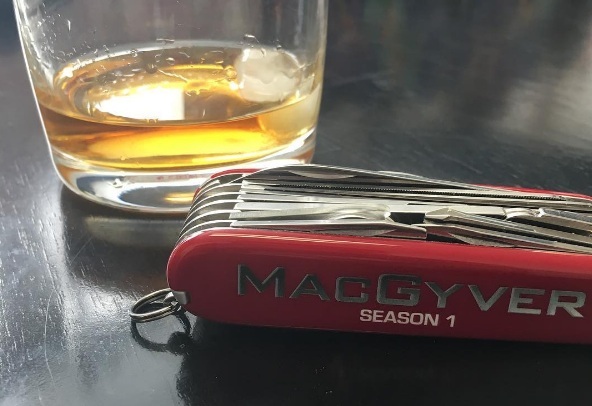 by Script Writer Brian Durkin, Co-Executive Producer David Slack, Assistant Sean O'Reilly, Composer Keith Power, recurring cast member Aina Dumlao, Stuntman Michael Li or crew members "etc317", Cornell Willis and Kirk Riley). It is quite a dangerous gift, though - Publicist Beth Haiken already suffered her first puncture wound. Peter Lenkov confessed that Jack's selfie habit with bad guys (before punching them) is getting out of hand. By posting a short video of David Slack demonstrating a MacGyverism involving a film cannister to the prop departement, he revealed why the show is so much fun to write for. Justin Hires was very excited for his character Bozer joining the team. He also posed for BtS-pictures with Bozer's Elf Apron. In a video by Tristin Mays, Lucas Till tests the Golden Magic Slingshot that she got him as a gift. He doesn't succeed on the first try, but he does succeed. 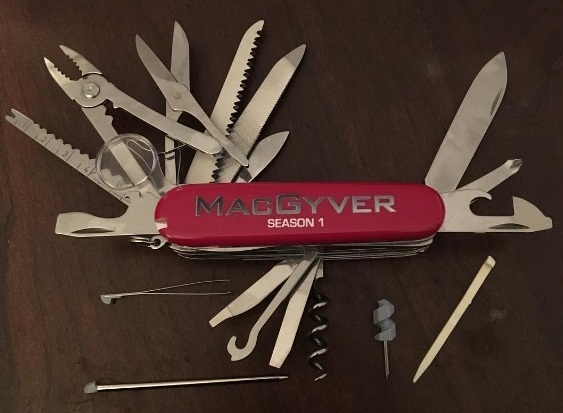 Even New MacGyver needs some training, after all. Extra Michael Tow showed us what serious agents Cho and Brooks look like while getting ready for filming. Meanwhile, crew member Jes tested a creepy mask - another one of Bozer's creations? After the high ratings of Episode 9 (Chisel, 8.12 millions), Episode 10 (Pliers, 7.42 millions) wasn't as good in numbers. Overall, the ratings are still steady, though with Episode 11 (Scissors) as the Christmas Episode at 7.67 millions. 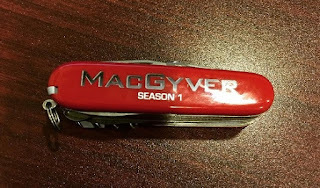 On December 22, CBS Express published the press release for Episode 13. It's written by Andrew Karlsruher (CSI: Cyber) and directed by Sylvain White (Hawaii Five-0). We got two clips for Episode 11 (Scissors) via SpoilerTV. Additionally, ET Online shared an exclusive clip that reveals more of Jack's history with Riley's mother. If you're interested in the songs used in Season 1, there's a neat little site that has it all in one place. 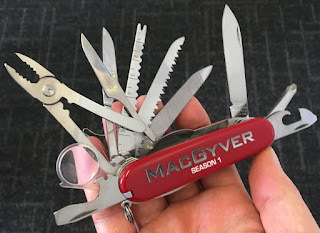 As Google's Year in Search revealed, MacGyver was one of the most-googled search words in September. In an Interview with Matt Carter, Peter Lenkov talked about why he brought the character Bozer into the show and why he thinks that "personal stuff" makes an episode stronger. StuntTeam and crew engaged in the project "Toys for Tots" to collect Christmas gifts for children who otherwise wouldn't have any this year. What a nice gesture! Central Casting Georgia has made several casting calls; e.g. for bus passengers and administrators, for Atlanta Policemen, for "great drivers who can parallel park like experts" and for people in their 20s-40s that can portray mourners. Peter Lenkov confirmed to a fan that MacGyver's grandpa will make an appearance on the show "at some point". Sounds like we might have to wait for the second season for this, though.